This sprawling shrub from tropical Africa grows to about 3 m tall. The opposite leaves to 10 cm long are narrowly obovate to elliptical. 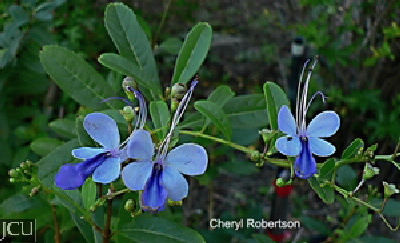 The ‘butterfly-looking’ flowers are in loose panicles, corolla to 2.5 cm long, anterior lobe is a darker blue than the others; filaments blue to purple and anthers blue. Fruit a 4-lobed capsule. Parts poisonous if ingested.